Halloween contacts can add a scary and authentic touch to whatever costume you choose to decide to wear this year. Everyone wants to dress up as their favorite character, but without the right attire and accessories, it just doesn't seem perfect enough. Whether you're a fan of superheroes, vampire novel characters, futuristic robots or anime, there's a pair of lenses out there waiting for you. 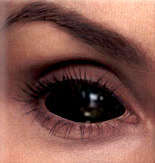 Halloween contacts range from cult classics such as the Vampire Chronicles to werewolves and from popular characters such as Itachi to Hello Kitty. Whether you're into dressing up or not, there's no harm in a little extra shock with a pair of soccer ball-patterned lenses or full on demonic black eyes. Or, mesmerize your audience with some hypnotic, glowing blue eyes. You only get to go all out once a year so whatever it's going to be, make sure it's going to be something memorable with a pair of Halloween contacts.